Welcome to TMG: Musical Sunday Story Time With Peg + Cat Feb 21st! Musical Sunday Story Time With Peg + Cat Feb 21st! It’s going to be totally awesome! Peg+ Cat along with all the programming that come from the Fred Rogers (Mr.Rogers) Company are not only amazing, but the best programming available for your child hands down. Peg + Cat host these wonderful events for free for the kids, and it is something super special and not to be missed! Check out the details below we hope to see you there!
' 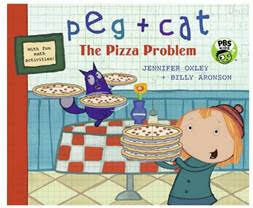 "To celebrate the release of “Peg + Cat: The Pizza Problem,” the latest installment in the popular Peg + Cat book series from Candlewick, kids and families can join Peg, Cat and authors and series creators, Jennifer Oxley and Billy Aronson, for a very special – and musical – Sunday Story Time at Powerhouse on 8th in Brooklyn on February 21! In addition to a special book reading, attending kids will be treated to an amaaaaazing ukulele sing-along! It all adds up to a super fun day! Below is more info about the book and the multiple Emmy Award-winning PBS KIDS TV series from The Fred Rogers Company as well as a link to more details on the upcoming event. It’s opening day for Peg’s Pizza Place! Peg and Cat are excited to take their first order—from the Teens!—only to learn that some of their customers want a whole pizza while one of them wants half a pie. How can Peg and Cat make half a pie when they don’t know what half is? Luckily, Ramone and Mac are there to help, with a slice up the middle of the pie. As more customers come in, things get entertaining, with Peg singing a jazzy song and Cat doing a dance. But soon there’s another problem: four orders, but only two and a half pizzas left. Peg is totally freaking out—until Cat reminds her that when it comes to halves and wholes, it’s all in how you slice it.